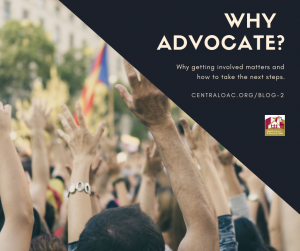 Before my time at the OAC, I didn’t know much about advocacy. I was politically involved in that I voted and did my research before I went to the polls, but I knew next to nothing about following legislation or contacting my representatives. Through attending multiple Advocacy Workshops put on by our partner Presbyterians for a Better Georgia, I’ve learned a great deal about how to be a better advocate and why it’s important for my work at the OAC and my life outside the center. They really do listen! While it might be hard to believe, I’ve seen evidence that my representatives do read my communications with them. While my US House and Senate rep’s might not directly read all my emails and faxes, they get information through their staff about how their constuents feel, and if I don’t tell them, they can’t know! My state representatives are even more communicative. I’ve received personal emails back several times from Elena Parent and Bee Nguyen when I’ve contacted them about specific legislation. So, while it can feel like a drop in the bucket, all those drops add up. Changing the system means BIG CHANGE. Many of us are dissillusioned by politics right now, which is understandable. However, like it or not, the way to make big changes happen in our society is to change the way our infrastructure and politics function. At the OAC, we work every day to open doors out of homelessness, but we also want to prevent homelessness from occurring, which means fighting to put into place protections for affordable housing, access to healthcare, and access to education for people like our guests. These things can only happen if we change the systems that cause homelessness. It’s a right and an honor. As a woman, I wasn’t always allowed to be involved in our political process. Many people spent years fighting for me to be able to have a voice, and I’m grateful. Not everyone in every country is afforded the right to have a voice in their political process, so I see it as my duty as a participant in democracy. Democracy only works if we all make ourselves heard, so I encourage you not to be despondent in our divisive times – let your representatives know how you feel, even if that feeling is frustration and anger! Things can only change if we do something about it. So, get out there and do something! Join us and Presbyterians for a Better Georgia for a training on January 26 and for our Day at the Capitol on February 6th. Register here! Here we are in December, a time when we probably think about “peace on earth” more than any other time of the year. And yet, it can feel like peace is getting further and further away from us. It seems that the reality in our world these days is the opposite of peace. 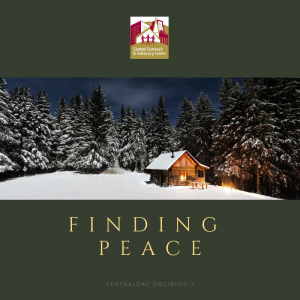 At Central Outreach and Advocacy Center, we also have our share of times when peace seems out of reach. . As people walk through our doors each day, some have roamed the streets all night, others have tried to find a safe place to lay their heads, and some are carrying such intense burdens that peace is something they no longer even consider. In order to try and offer a place of peace for everyone, we limit the number of people we serve each day. We base the number of guests we see on how many case managers are present to meet with our guests one on one. Sometimes, if we get too many people in our space at one time, it can create a chaotic and unruly environment for everyone, an environment that resembles nothing of peace. I have worked the front desk several times in the last few weeks, which is something I don’t regularly do anymore. The front desk is the first place where we encounter our guests, so we want it to be a positive interaction, but it can often be stressful instead. At the front desk, we find out what services our guests need and we tell them whether or not we can assist them, which can sometimes lead to disappointment and anger. In my opinion, the front desk is the hardest place to work. It’s the place where we may have to tell someone, “No, we can’t assist you today.” Telling someone “no” is never easy, but telling someone “no” when they are at the end of their rope is even harder. A week or so ago, a woman came in late in the morning and I greeted her at the front desk. She told me that she had recently found herself in a homeless situation. She said that she was working and was even up for a promotion after the first of the year, but she needed a homeless verification letter in order to keep her children in their current school, rather than uprooting them to another one. She started crying tears that were so heartfelt that I almost started crying with her. She broke my heart. We had already filled all of our slots for the day, but the team was working through the list at a steady pace. I felt like we could possibly see her, but clearly told her that there was a chance we might not get to her before we closed, and if we didn’t, she would have to come back another day. She said she was willing to take the chance. We don’t ordinarily ask people to wait around with no guarantee of being seen, but I wanted so badly to be able to serve her that I was willing to make an exception. She waited patiently and we were able to serve her. I like to believe that the small thing we were able to do for her gave her a peace that she was not able to experience when she first walked through our doors. When I worked the front desk yesterday, a gentleman came in late morning. He needed a variety of items: reading glasses, a dental referral, clothing, food stamps, and a homeless verification letter. The most important thing he needed was the homeless verification letter to continue his treatment for cancer. We were running behind yesterday and I could not put this man on our list to be seen. He told me a little bit of his story and pleaded with me to help. I told him we couldn’t and explained that he would need to come back the next day and arrive much earlier than he had that day. He fought back the tears, but said he would see me tomorrow. My heart hurt. Today, I walked through the lobby right after we opened, headed to my office. I heard a guest call out to me, “I’m back!” I turned to see who it was, and it was this same man from yesterday. I smiled and told him that I was glad. He was first on the list to be seen today and I have to believe that he walked away today with at least a small amount of peace that he did not have yesterday. We can’t do everything for everybody. We have to have boundaries. We have to say no. But, I believe that we also do as much as we can to bring a small amount of peace to those who walk through our doors each day. And for that I am grateful. My hope for each of you reading this blog today is that you find the peace you are looking for, but more importantly that you find an opportunity to do something for someone else that will bring peace to their lives. This is important and can be done year round, not just during a particular season. Thank you for the many ways you support the good work we do at Central Outreach and Advocacy Center! Without you, we could not provide the services we provide, services that bring some peace to those we serve. Help us provide some peace this holiday season. 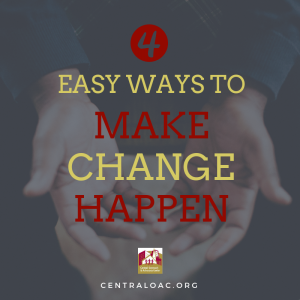 Be a part of changing lives at the OAC. Donate here. 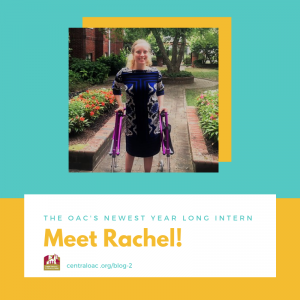 Rachel Carpenter joined to OAC team earlier this fall from the Young Adult Volunteer Program! We are so glad to have her as a part of our team and wanted to give you the opportunity to get to know her too! Tell us a little bit about yourself. Where are you from? What things are you passionate about? What do you love to do? I was born and raised in Charlotte, North Carolina. I’m passionate about learning from people’s stories and empowering them toward their goals. In college, I enjoyed building relationships with international students and immigrant families as well as fostering community across different faiths and worldviews. In terms of hobbies, I love singing in choir, learning languages, spending time in nature, reading world literature and memoirs, and watching international films. You recently graduated from college. Where did you attend and what did you study? I attended Davidson College. I majored in Psychology and minored in Religious Studies. Why did you want to be a part of the YAV program and why did you choose Central OAC as your site? As graduation approached, I was searching for a way to transition from school, the only context I knew well, to the workforce. I decided to join the YAV program because of its commitment to high-impact service through relationships. It seemed like a balanced way to primarily focus on empowering communities in a respectful, lasting manner while also discovering what contexts I would work best in. It would be a challenging and transformative year that would inform my lifestyle and work in the future. I appreciate the spiritual focus of the YAV program. I consider this service year to be a pilgrimage of walking beside communities in Atlanta. The spiritual foundation of the program provides grounding for the service that is not always found in every volunteer program or nonprofit position. I chose the OAC as my placement because the staff members are clearly passionate about the guests as whole people, and they approach the mission of reducing and preventing homelessness holistically through job readiness programs, a self-sustaining food co-op, and identification. Growing up, I really enjoyed volunteering at local shelters and Room in the Inn programs at various churches. While working at the OAC, I would be interacting with those experiencing homelessness in a different context than I had seen before. It would present new challenges and lessons, so I very much appreciated the opportunity to learn from that. What have been your favorite things about working at the OAC so far? What about the biggest challenges? One of my favorite things about the OAC is that the passionate staff and volunteers strive to find the humanity that is often lost in a dehumanizing system of procedures, regulations, qualifications, and tons of referrals. We cherish the full stories of each of our guests. We try to cultivate and maintain a sense of sacred ground within our office as a place where everyone is met exactly where they are in their vulnerabilities and innately respected as full human beings. It’s encouraging to see that some guests do truly feel welcomed and heard. I always appreciate learning from the experiences of guests and sharing in their lives. Conversely, the hardest part about working here is that there must be boundaries and our own regulations for the center to function. We are limited. The number of people seen changes every day based on the number of trained volunteers. We are only allowed to pay for certain documents. For everyone’s safety, some struggling guests are asked to return on another day after waiting in the cold for hours. It is very hard to maintain a sense of sacredness and dignity while working with systems not designed for that, and the OAC as a human organization is not perfect. What are you most looking forward to during your year doing YAV? I look forward to immersing myself in a new city and learning from the community. Reflecting on both the positive and negative experiences with other YAVs in Atlanta will help me remain grounded. Future plans are still being developed. My long-term goal so far is to go to graduate school. I’m considering either a Masters in Counseling to focus on families and adolescents or a Masters of Divinity to become a chaplain. For the upcoming calendar year, I’m looking for jobs in the region. Knowing the best ways to support our work can be overwhelming. Between fundrasiers, donating toiletries, and volunteering, there are a lot of options, especially if you’re short on time or resources. But even if you have limited time or money, there are still some incredibly easy ways to give back. This is a brand new option for us, and we’re excited to share it with you! 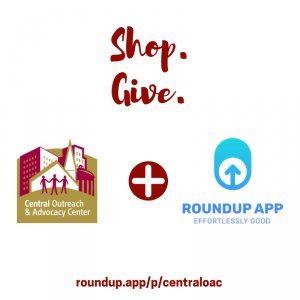 This app automatically rounds every purchase you make to the closest dollar and donates the extra change to us! No one likes change anyway, so why not send yours to a place that needs it? Sign up here today. 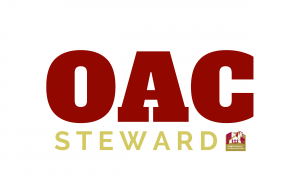 Another new oppotunity, and perhaps the one we’re most excited about: OAC Stewards! Known elsewhere as “recurring donors” or “monthly givers”, OAC Stewards help support us year round. This is a great option for people who are unable to give a large lump sum and allows you to spread out your giving over time. Become an OAC Steward today by choosing “monthly” under “donation frequency” here, and receive a free bumper sticker, like the one pictured above! This is another great option if you want to give automatically with each purchase you make! Amazon Smile gives a small portion of each purchase you make on Amazon to a charity of your choice. 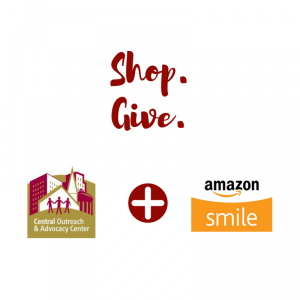 Visit smile.amazon.com and choose Central Outreach and Advocacy Center as your charity to get started! Do you shop for groceries at Kroger? 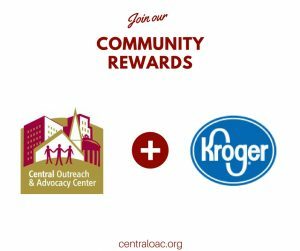 If so, register your Kroger Plus card, choose us as your charity, and Kroger will donate to us each time you shop! It’s quick, easy, and especially great for those with limited finances, since you’re not actually the one who has to do the donating! We appreciate all the different ways we get support from donors and volunteers. We couldn’t do our work without you! For more information about donating or volunteering, visit the drop-down menu under “Get Involved.” We also hope you’ll consider some of these new out-of-the-box donation options to help us serve even more individuals experiencing homelessness.